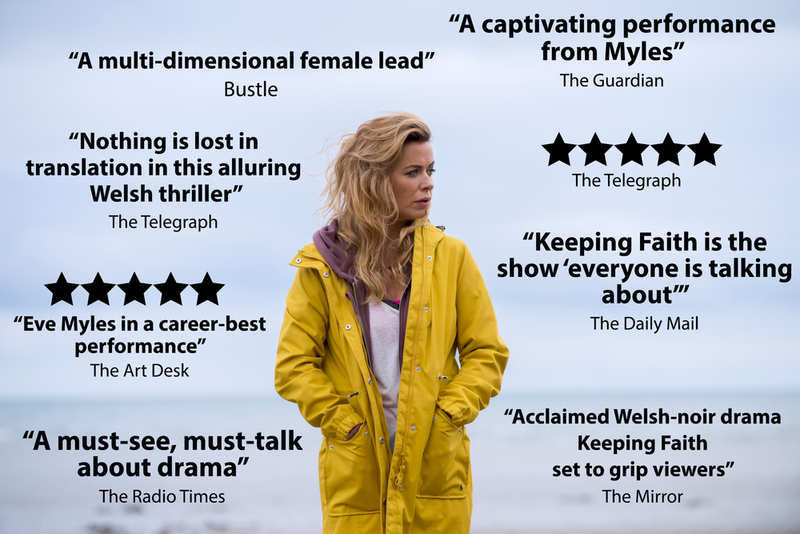 KEEPING FAITH tells the story of lawyer, wife and mother Faith (EVE MYLES) as she fights to find the truth behind the sudden disappearance of her husband. She comes to discover that her beautiful, idyllic home town, set on the estuary, harbours many dark secrets that threaten the lives of Faith and her family. Faith’s ordeal transforms her from a stay-at-home, fun-loving and carefree mother to detective, action hero and lover. She takes risks and gambles and finds a new inner strength. Mae Un Bore Mercher yn adrodd stori y fam, y wraig a’r cyfreithwraig Faith (Eve Myles) wrth iddi frwydro i ddarganfod y gwir tu ôl i ddiflaniad ei gwr. Dysga bod y dref arfordirol, hardd sydd wedi dod yn gartref iddi yn celu cyfrinachau lu sy’n bygwth bywydau Faith a’i theulu. Mae’r gorchwyl yn thrawsnewid Faith o fod yn fam llawn hwyl i dditectif diflino. Mae’n mentro mewn ffyrdd hollol annisgwyl a thrwy hynny yn darganfod cryfder wnaeth hi erioed ddychmygu oedd ganddi. Keeping Faith/Un Bore Mercher has been nominated for 6 awards at 2018’s BAFTA Cymru. The nominations recieved; for Actor, MARK LEWIS JONES, as Steve Baldini; for Actress, EVE MYLES, as Faith Howells; for Costume Design, SARAH-JANE PEREZ alongside Original Music for AMY WADGE and LAURENCE LOVE GREED; and Photography and Lighting, STEVE LAWES and MATTHEW HALL, for Writer. Eve Myles wins for her role as Faith Howells in Keeping Faith/Un Bore Mercher.